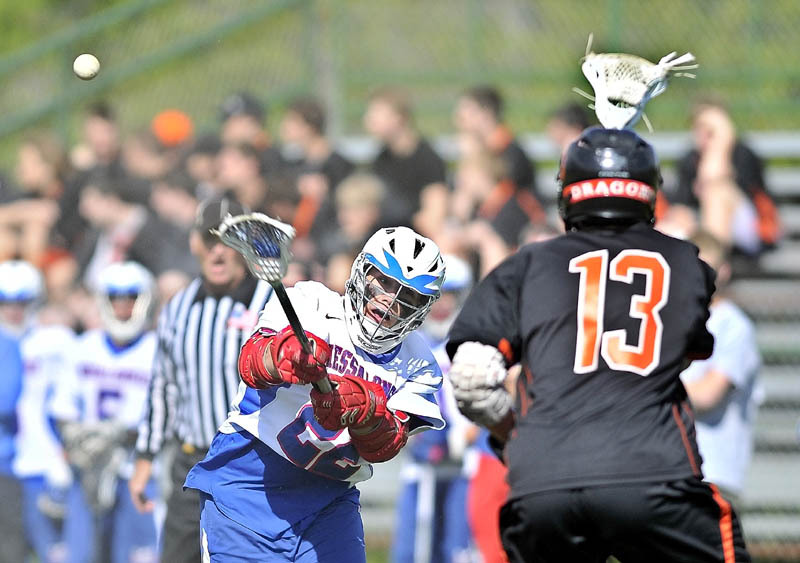 OAKLAND -- Both the Messalonskee and Brunswick boys lacrosse teams knew a fast start would be a key to Friday's game. It was Brunswick that capitalized early, while Messalonskee was left to lament another slow start. OAKLAND — Both the Messalonskee and Brunswick boys lacrosse teams knew a fast start would be a key to Friday’s game. It was Brunswick that capitalized early, while Messalonskee was left to lament another slow start. The Dragons scored four goals in the first four minutes of the game, and used the early momentum to take a 13-7 win over the Eagles. Brunswick (9-1) was coming off a 9-8 overtime loss to Lewiston. The Dragons felt they needed to jump on the Eagles quickly, unlike their effort against the Blue Devils. Junior Bailey Caparrato scored the Dragons’ first five goals, the first four coming in the opening four minutes of the game. When George Rowe scored with 2 minutes, 47 seconds left in the first quarter, the Dragons had a 6-0 lead. Brunswick’s transition game was key to the early offensive surge. The Dragons quickly worked the ball from their own defensive zone and attacked the Eagles. “Once we started clicking, we just kept pushing it very fast, and they didn’t know what to do,” Croatti, who had a goal and three assists, said. Messalonskee (5-4) got three consecutive goals, one from Aidan Calkins and two from Ben Weeks, to cut Brunswick’s lead to 6-3 in the second quarter, but the Eagles got no closer. Weeks scored three goals for the Eagles. Caparrato scored six goals for the Dragons, while Ryan Croatti added four goals. MrVichin made six saves for Brunswick. Messalonskee used two goalies. Jacob Smith played the first and fourth quarters for the Eagles and made seven saves. Elija Tuell had six stops in the second and third quarters. “Jake wasn’t really sharp in the beginning, but we brought him back in the fourth quarter and he played much better. Elija’s been working hard all year long and it was good to get him in there,” Sheridan said.